Part Diamond Set Wedding Ring — Form Bespoke Jewellers Ltd.
A platinum part diamond set wedding ring. A sparkling wedding ring, created to complement the customer’s Platinum Tiffany Style Solitaire Engagement Ring. The customer returned to us for a bespoke platinum, wedding ring. They chose a traditional court profile to complement their engagement ring, and the width of the band also suits their chosen diamonds beautifully whilst also being comfortable to wear. Two thirds of this wedding ring is grain set with round brilliant cut diamonds. All the diamonds are of matching colour and clarity for a flawless finish. 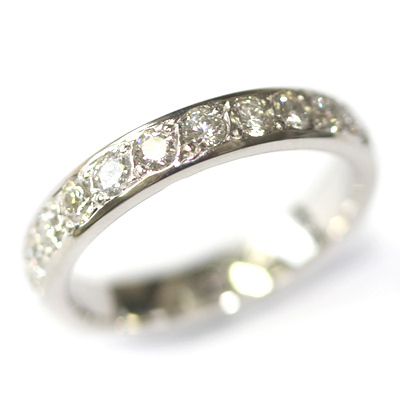 The customer also returned to us for a Fully Diamond Set Eternity Ring. We feel very proud to have created a beautiful and bespoke Platinum Diamond Engagement Ring, Wedding Ring and Eternity Ring Set for them.